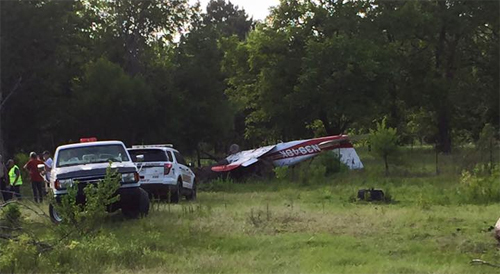 On July 08, 2015, about 1515 central daylight time, a Piper PA-28-140 airplane, N3949K, sustained substantial damage following a collision with an embankment and trees during takeoff from a private airstrip in Oakdale, Louisiana. The private pilot, who was the registered owner, and passenger were seriously injured. Visual meteorological conditions prevailed at the time of the accident. The flight was being operated in accordance with 14 Code of Federal Regulations Part 91 as a personal flight and an instrument flight plan had not been filed. The intended destination for the flight was the Livingston Municipal Airport (00R), Livingston, Texas. The pilot reported a loss of engine power at 40 feet above ground level (agl) and the airplane settled back to the ground about 2,000 ft from the beginning of the takeoff roll. He reported that his grandson, who was watching, stated "the takeoff was normal and then it sounded like the engine quit running." The pilot also reported his neighbor was sitting outside and saw the airplane "lift off the ground for several feet as normal and it sounded as if [the pilot] let off the gas." A Federal Aviation Administration (FAA) inspector interviewed the pilot the day after the accident. The pilot reported he looked at the wind sock prior to take off and noticed it was hanging down and not moving. He proceeded to takeoff to the north as he typically liked to do because of the height of the trees on the south end of the airstrip. As the airplane became airborne, about 40 ft agl, he realized he had a 10 to 15 knot tail wind and the aircraft began to lose altitude. He advanced the throttle to full power. The FAA inspector asked the pilot if the engine was producing power and the pilot confirmed it was. The inspector reported the pilot stated, "it was at that moment he realized he had messed up." The airplane hit trees, became inverted and hit the ground. The pilot added that his grandson told him he looked at the windsock during takeoff and noticed "a gust of wind had filled the windsock in the direction of departure." The pilot remarked the next time he flew he was going to get wind direction in his local area from the weather service.